Ya gotta know where you're going to get to this little lake. If you have a high clearance vehicle & 4x4 this lonely lake paradise can be yours for the weekend ( well except for an occassional wandering hiker, jeep, motorcycle or fisherman). Tucked way in the northern end of the Tahoe National Forest, back behind the Sierra Buttes, Smith Lakes is not easy to reach, but with determination, your reward will be wonderful. Plenty of seclusion, snowmelt, creeks, trees & a prime little campspot. Perfect your kayak & fishing skills! But remember the bug repellant. Bring your fire permit & everything you'll need, cuz there ain't nothin' for miles & miles. No gas, No stores, No phones. The access is a 6 mile dirt road (marked for OHV & 4WD) which becomes progressively worse as you near the lake. Large rocks & boulders must be carefully manuevered down some steep section, along witrh several creek crossings. This place is probably only reachable by vehicle from late Spring to Fall, as the snow could make navigating very difficult. A detailed map of the region is a neccessity! The standard Tahoe National Forest is not nearly detailed enough. There once was a travel site based on the East Coast somewhere, who tried to cover everything in California - even the small lakes. DanaMite emailed to inform them that their Smith Lake link was pointing to another Smith Lake in a totally different county. 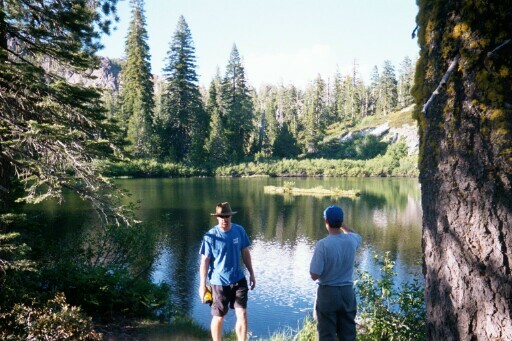 (often there is more than one lake with the same name). Sadly she found many geographic mistakes in their huge nationwide database. 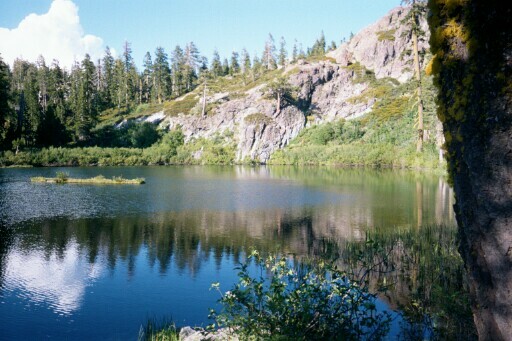 The creators of that site had never been to these lakes, nor any California National Forests for that matter. If you are looking to find the remote, secluded areas of the golden state, steer clear of big commercial travel web sites that try to cover too much information. Stick with this little, independent, decade old web site, Total Escape for everything outdoors in California. Support this life-long effort by buying a map from Total Escape, so you will not get lost on these back roads! For a $20 map and a tank of gas, you can have your own, unique road trip in Cali - this weekend!